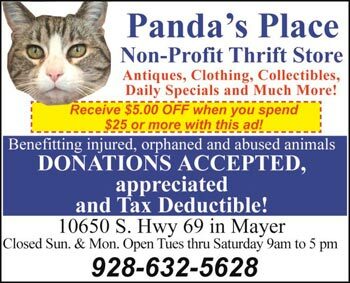 Starting on January 1, 2017 we will be calling our Thrift Store Panda’s Place. Panda is our store cat and somewhat of a celebrity, everyone loves visiting with her. When we were at our old location Panda’s former owner left her behind when he moved to California and we would leave food and water outside for her because she would not come to us at first but little by little we would move her dishes closer to our door and then we finally were able to put it in the store and she got used to being inside and started to love all the people and sleeping on all the fun things inside the store. Seven years later and Panda is still making friends at our new location and loving all the attention. Panda is getting up there in age, we estimate her to be between 16 and 17 so she does sleep a lot these days but she still likes all the attention. When you come into the store the first person you will probably meet is Bonnie, she is usually the one at the ironing board ironing all our clothes making sure they look beautiful and ready to wear. Helen our volunteer is usually running around in her slippers making sure everything is clean and sparkling. We are so lucky to have these amazing women working so hard to make our store look and smell great. Please stop in and buy lots of stuff or bring us your gently used items. Donations are tax deductible. You can also leave us something from our wish list at the store or some treats for Panda.